One tap is all it takes! TapCan is the most effortless trash can ever invented. Designed to work with your natural body gestures, TapCan's smart pedal design does the work for you! Unlike step trash cans that require you to apply foot pressure and hold the pedal down for the lid to open, our patented technology automatically opens, then gently closes, the lid with just one tap. The advanced pedal technology even lets you double tap the pedal for a timed, five-minute lid open.Our enhanced, energy-saving technology extends the life of the battery up to 2 years with just 4 D sized batteries. The elegant, fingerprint- proof, brushed stainless steel finish and choice of three trim colors complement any room. This 13-gallon trash can is designed for space-efficiency and is perfect for the kitchen, office, or lobby. TapCan is the smartest, easiest trash can you will ever use! This 50L & 6L Trash Can Combo comes with a brushed stainless steel finish with fingerprint resistant feature. It is pedal operated with a hinged lid that makes it easy to dispose of your waste. Damper system provides soft close effect on lid. Plastic Inner bin removes for easy cleaning. TapCan 13 Gallon Pedal Sensor Trash Can with Deodorizer (Black Trim) One tap is all it takes! TapCan is the most effortless trash can ever invented. Designed to work with your natural body gestures, TapCan's smart pedal design does the work for you! Unlike step trash cans that require you to apply foot pressure and hold the pedal down for the lid to open, our patented technology automatically opens, then gently closes, the lid with just one tap. The advanced pedal technology even lets you double tap the pedal for a timed, five-minute lid open.Our enhanced, energy-saving technology extends the life of the battery up to 2 years with just 4 D sized batteries. The elegant, fingerprint- proof, brushed stainless steel finish and choice of three trim colors complement any room. This 13-gallon trash can is designed for space-efficiency and is perfect for the kitchen, office, or lobby. 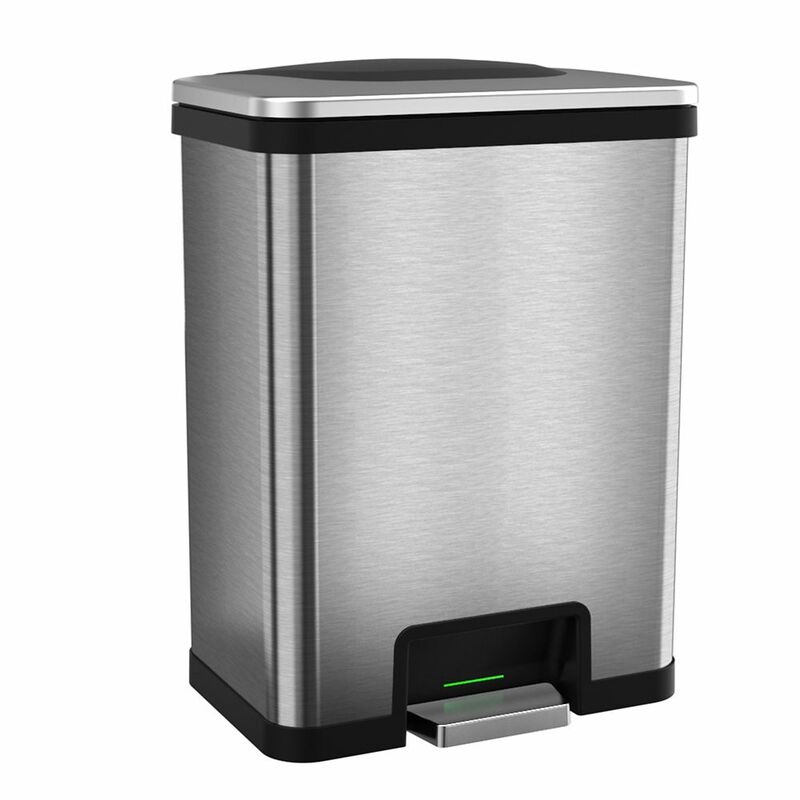 TapCan is the smartest, easiest trash can you will ever use!